The logic of the way the infantry were organised, and the quality of the officers, was not, however, sufficient. Desertion was a major problem, and it did not prove possible for Edward I to keep large numbers of men in the field for any considerable length of time. For example, there were almost 3,500 Yorkshire infantry in the army when it mustered at the end of June 1300. A month later the number was down to 1,483. Edward was understandably furious, and wrote to the keeper of the wardrobe. ‘We are sending you under our seal the names of the footmen from the county of York who have left our service and our host without our leave. These people have maliciously deceived us and have traitorously failed us in our business.’ In 1301 he complained to the officials of the exchequer that as he had no money, he could not prevent his troops from leaving. Now, a medievalist like Prestwitch can explain the customs of warfare around the year 1300 which made invading a distant country unbearably expensive better than I can (There is a handy article on the situation in Geoff Mortimer ed., Early Modern Military History, 1450-1815 (Palgrave Macmillan, 2004)). But this is relevant to a point which I make in the Doktorarbeit. People often describe Achaemenid infantry as “reluctant levies” and explain that the kings did not trust their subjects in the provinces and preferred to rely on Persian cavalry and foreign mercenaries rather than train and equip the peasants. Eduard Meyer was trying to decide what he thought of this idea a hundred years ago (Geschiche des Altertums, Band 4, S. 63 if you read German). But in every single society with conscription which I have looked at, I find that there was a great deal of reluctance amongst the future draftees to spend years in a distant land. Kings and republics were often much more eager to recruit soldiers than to feed and pay them, provide medical care when they were wounded, and support their children if they were killed. So in every society which I have looked at, conscription for a distant war at least provokes grumbling, and usually efforts to avoid going, whether those involve legal loopholes and convenient ailments, hiding from the census-taker, or getting together to murder the conscription officer on some lonely road and hide his body. The more ambitious the rulers, the more intense the resistance. Nathan Rosenstein noticed that after Gaius Gracchus offered free land to citizens, the next census registered 25% more cives, which suggests that at least a quarter of the eligible population had avoided being registered on the list which was used to recruit soldiers. Some armies turn reluctant draftees into an effective fighting force, and others do not. So whether or not Babylonian levies were “reluctant” is about as relevant to the question of their effectiveness as the shape of their skull. A Persian scythed chariot as imagined by the artists at DBA Online http://www.dbaol.com/ I like the style and colour, although someone should have reminded the artist that these chariots just had a driver, no passengers with bows! As I write a section of the chapter of my dissertation on Greek literature, I have been thinking about how that literature drives ideas about the Achaemenids along certain channels. 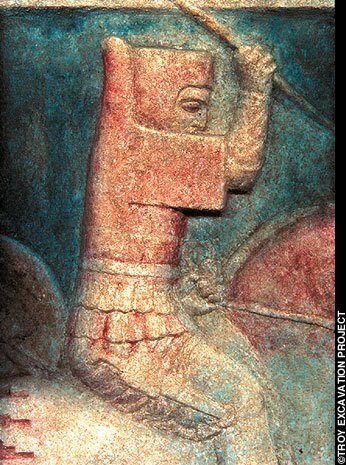 Achaemenid historians trained as classicists have trouble forgetting a long list of tropes, stereotypes, and traditions which began in the Achaemenid period but were even more vividly expressed in Roman times. 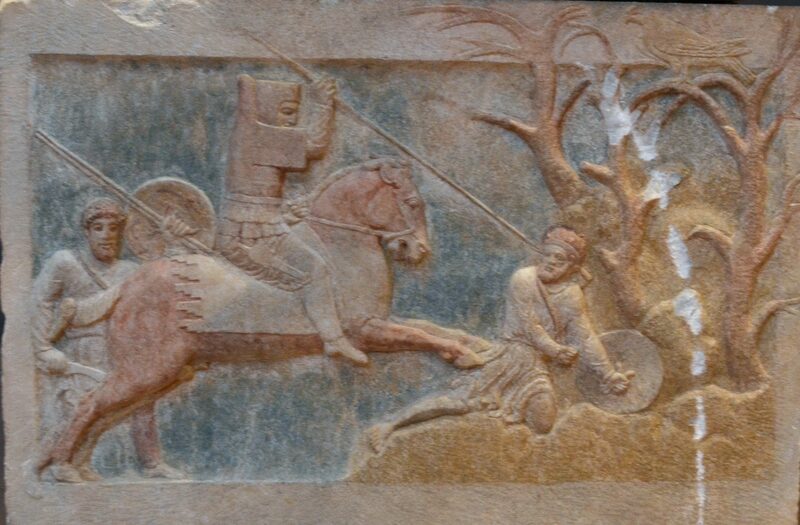 A good example is the most famous Persian weapon, the scythed chariot. Entrance to the Fachbibliothek Atrium, North Wing, Universität Innsbruck. Photo by Sean Manning, February 2015. Despite some health difficulties, I have been slowly making sense of the Gadal-iama contract and updating my transcription and further reading in an earlier post. Perhaps “making sense” is not the right expression. Because while historians happily quote translations of this text into fluid English or French, the original Babylonian is full of rare words, technical phrases whose meaning is not fully understood, and intricately nested sub-clauses. 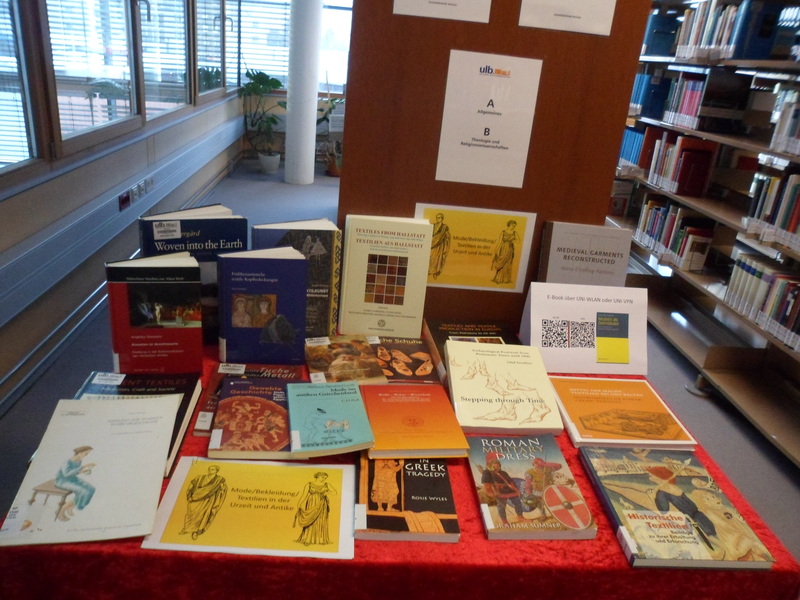 After the book by Guillaume Cardascia in 1951 and the article by E. Ebeling in 1952, both of which discuss the difficult points of this tablet and argue how to resolve some of them, translators have chosen to hide the uncertainties. Debate continues, but in philological venues where squeamish historians don’t always look. I am having trouble reconciling many of the details in the translations which I have read with the Babylonian original. So this is not the sort of text which you can read in translation with a light heart. I find it comforting that when I look up difficult words in the Chicago Assyrian Dictionary (the sort in 25 volumes which fills an entire bookshelf) I almost always find a short entry which cites this contract and perhaps one or two others. The specialists in cuneiform have trouble with this text too. And the three people who have transcribed the tablet almost completely agree about which signs are written on it. But I wonder how many other optimistic translations of ancient texts I am innocently relying on. [number lost] minas 4 shekels of silver, loin-girdling for the horse troops who are going to the encampment of the king [for] three years: 1 donkey which was bought for 50 shekels of silver in the hands of Ina-Esagil-Liša; 1/2 mina 6 shekels of silver, donkey-fodder; 12 mountain garments; 12 coats; twelve caps; 12 leather bags; 24 leather shoes; 1 PI oil; 2 PI salt; 1 PI cress, travel provisions for three years from the month Nisannu 9th year which are given to … [one name lost], Rīmūt-Bēl, Itti-Šamaš-balaṭu, and Akkadaia who are going to the encampment / Month Abu 10th day 9th year of Darius King of Babylon King of Lands. 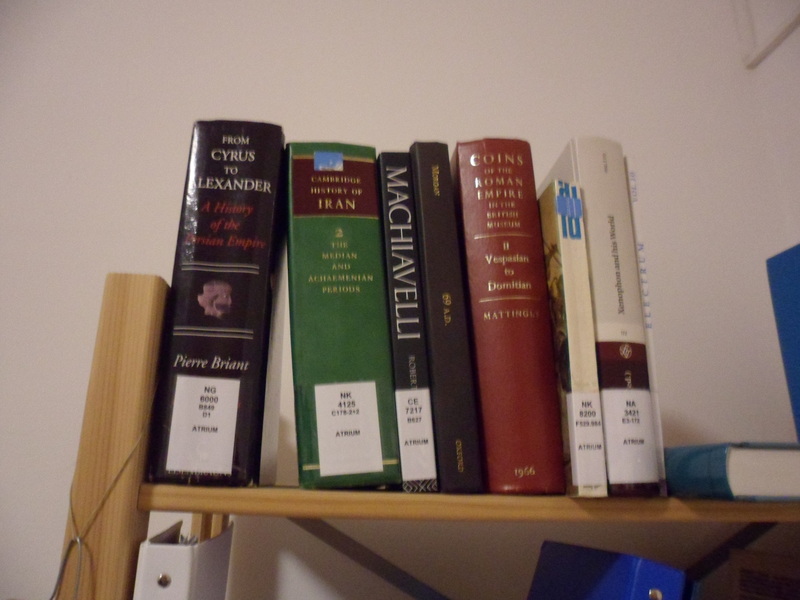 Digitalizing old cuneiform texts poses some special issues which digitalizing old Teubners and Loebs does not. Working with the Gadal-iama contract has been an excellent excuse to explore them. I hope that they will have some interest for my readers who don’t read Akkadian. Copyright is the first issue. At present I do not have time to make my own transcription of the published drawings (this has changed since October 2014- ed.). The following edition is based on that published by Henry Frederick Lutz in 1928. On the basis of Cornell University’s handy guide, I believe it to be in the public domain. 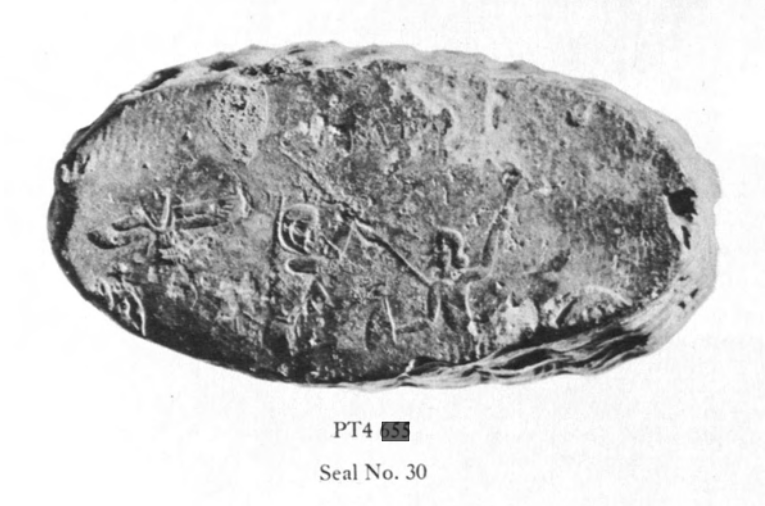 Our understanding of cuneiform writing has changed since 1928. An example which leaps out is that Lutz read the signs AN.BAR as the god Ninurta rather than the adjective parzillu “iron.” I have corrected this and noted where Ebeling’s more recent reading of other signs differs. 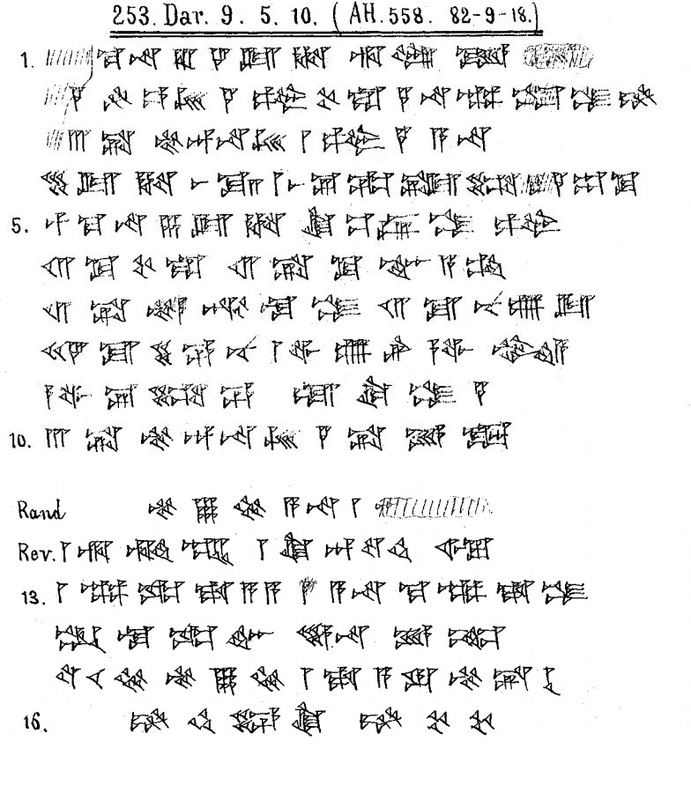 Conventions for transliterating cuneiform have also changed. 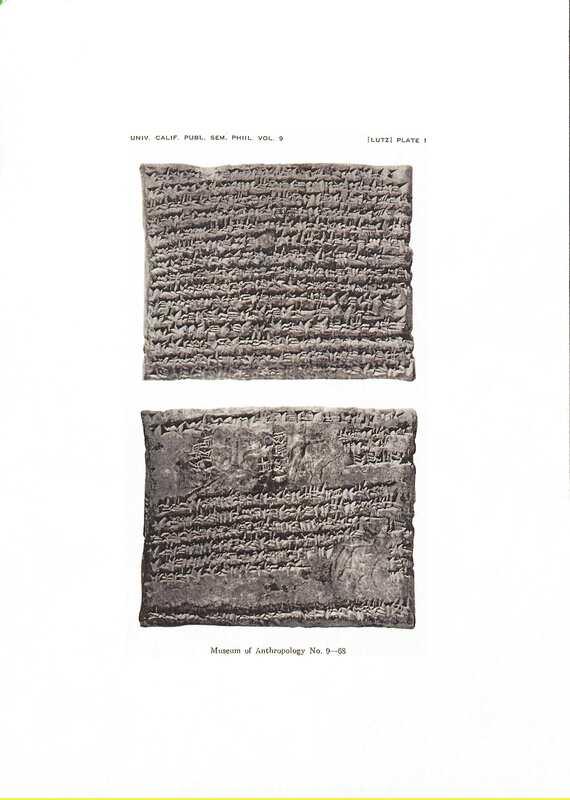 I have tried to move Lutz’ text towards the conventions of the Open Richly Annotated Cuneiform Corpus as defined in their Akkadian Stylesheet. I have replaced the most obvious logograms with the corresponding Sumerian, but not tampered with Lutz’ sign numbers and vowel lengths where they are slightly different from the conventions today (this has changed since October 2014- ed.). All capitalized Sumerograms and all material in brackets except for the line numbers are my own. This is neither a completely modernized edition (which would take more time than I have available) nor an exact transcription of Lutz’s edition (which would be hard for many Assyriologists to use). Serious scholars with access to a good library will want the second edition by Ebeling, but I hope that this will be worthwhile regardless. I would very much appreciate it if anyone who spots an error would email me. In the future I may make my own transcription to practice the script and understand which signs lie behind the logograms in the existing transcriptions. A Weakening Grip, or More of the Same? With the [Ionian] burning of Sardis in mind we may turn to the question of the Persian military presence in western Asia Minor. The evidence from the Greek sources is scrappy, but we know of a number of cases of fiefs being granted and of Persians having taken over good land. It is generally in rich plain land that we discover Persian landowners, in the Maeander valley, in the Colophon plain, the Hermus plain (Buruncuk), and the Caicus plain. Between these last two plains is the rough mountain country of Southern Aeolis, where we are told that the King’s writ did not run on the 460s when Themistocles went into hiding in one of the Greek cities there; and when the Persians took over the Maeander plain after the fall of Miletus (494 B.C.) the mountain country to the south was handed over to the intransigent herdsmen of the Halicarnassus peninsula. We also know that to the north, in the region of Mt. Ida, there were cities that had not been subjugated by the Persians until well on in Darius I’s reign [520-484 BCE]; and the impression that we receive is that the Persians occupied the good land without troubling themselves unduly over the control of the unproductive hill country, which was not suitable for fiefs. 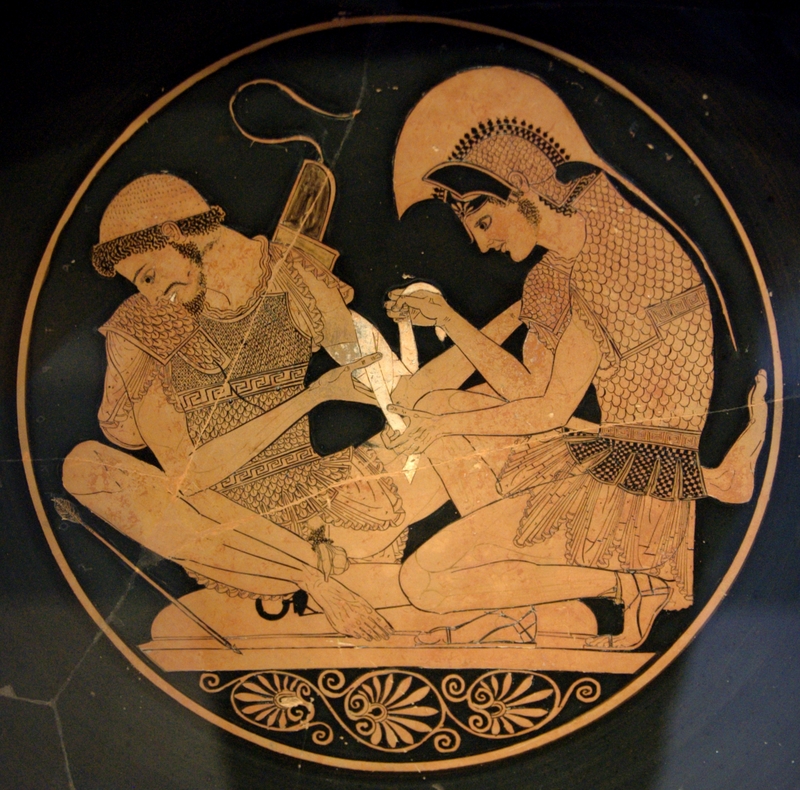 On the state of the empire, what emerges from Xenophon’s fine story [ie. the “Anabasis” set in 401 and 400 BCE], … is the fact that all the hill tribes, many of which appear in Herodotus’ list of contingents marching under Xerxes, were now out of control … This, and the weakness of the empire’s hordes of conscript infantry, was not lost upon the Greeks. Specialists in the Achaemenid empire like to argue whether the kings and governors were losing control of the Achaemenid empire in its last century of existence, or whether the empire was always a bit ragged about the edges. Greek and Latin literature implies that the empire was falling apart, but the Greek and Latin literature which we have was written or chosen by people who ‘knew’ that the Persians had become decadent and been overthrown by Alexander. As the above quotes show, two distinguished British historians writing in the same year could interpret the same evidence in opposite ways.